The cultural destruction wrought upon Eastern Europe by war and revolution is not well publicized in the west. Hundreds of thousands of books, manuscripts, maps and artifacts have been stolen or destroyed as a direct result of conflict. Consider for instance, the successive Soviet, Nazi and Soviet occupations of Lviv during World War II. While the human destruction has been largely documented, the loss of cultural wares and institutions has been almost forgotten. In the aftermath of World War II, the city’s Polish culture, like its majority ethnic Polish population was uprooted. Much was lost in the upheaval, but fortunately some parts of the Polish intellectual legacy were so important and prominent that they managed to be at least partially saved. Chief among these was the renowned Ossolineum (National Ossoliński Institute), an intellectual powerhouse of Polish literature and learning. Prior to World War II, the Ossolineum held hundreds of thousands of books, manuscripts, autographs and maps, many of which were the rarest of their kind. 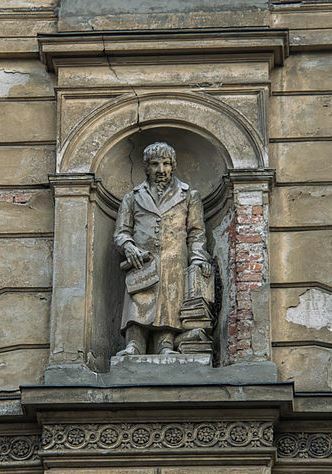 The material losses of the Ossolineum in Lwów (the Polish name for Lviv) can be somewhat quantified, but the intellectual loss was incalculable. The library survived in another form, in another city, in a new part of Poland. Today it is a storehouse of Polish culture in Wrocław (formerly Breslau, Germany). 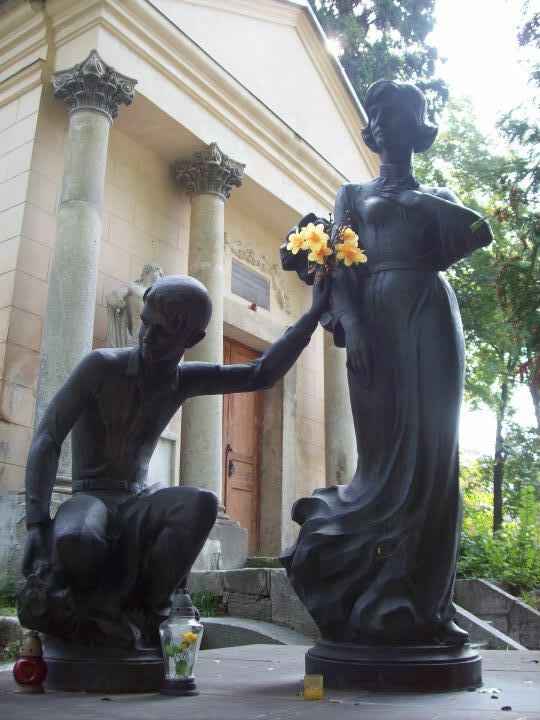 Meanwhile a new institution was created in the exact same place where the Ossolineum once stood, the Lviv National Vasyl Stefanyk Scientific Library of Ukraine. The library, like the city, became Ukrainian focused. Nevertheless, it is something of a miracle that both Ukrainian and Polish intellectual traditions still survive at these institutions today. This would not have been possible without the immense legacy of the original Ossolineum and the strong vision of its founder, Józef Ossoliński, a man who had also lived through geo-political changes which his love of learning had managed to transcend. Józef Maksymilian Ossoliński was the scion of Polish nobility. The Ossoliński family’s aristocratic roots stretched all the way back to the earliest days of the Polish Kingdom. Over the centuries they acquired estates across the eastern parts of the kingdom. 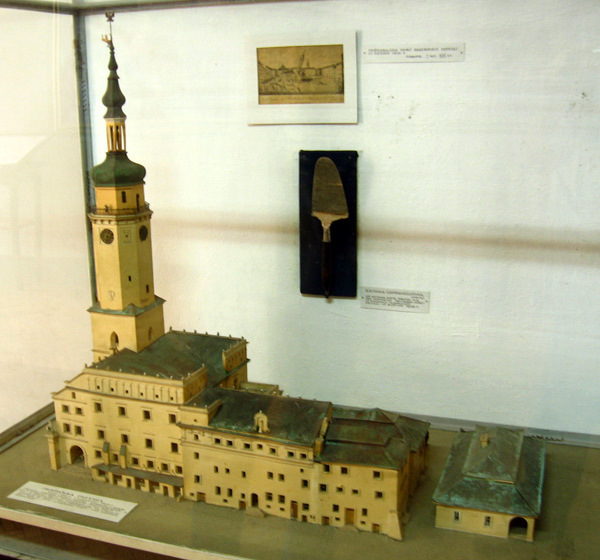 One of these, Krzyżtopór, was home to the largest castle in Europe before the construction of Versailles. The family’s wealth and splendor was threatened by the late 18th century in one of the most turbulent periods in Polish history as the Polish-Lithuanian Commonwealth disappeared during three partitions. The Ossoliński family estates were now in lands ruled by the Austrian and Russian Empires. It was during these times that Józef Ossoliński came of age. Because of his homeland’s geopolitical situation Ossoliński developed hybrid loyalties, straddling the lines between Polish nationalism and adherence to Austrian rule. 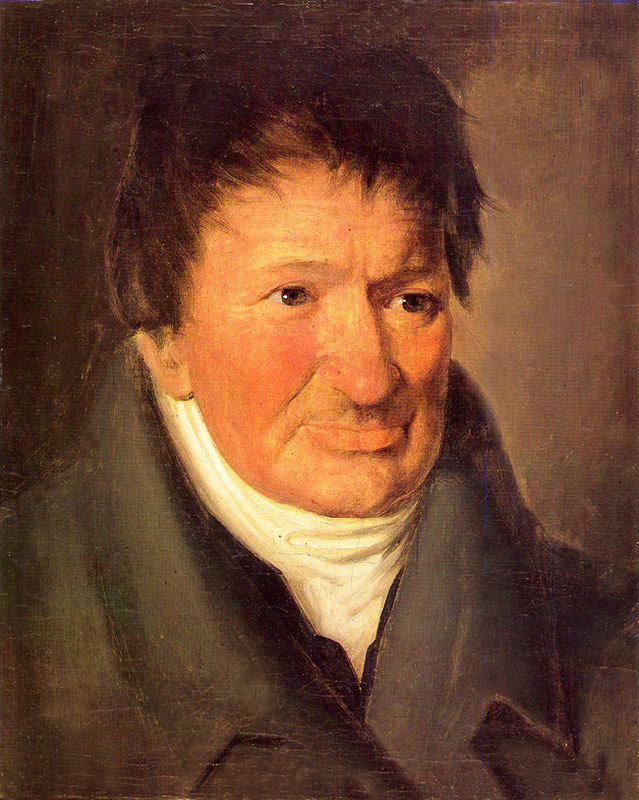 At the time when the Commonwealth suffered through its third and final partition in 1795, Ossoliński was living in Vienna where he was head of the Austrian Imperial Library. He was known to be a voracious reader and researcher with a love for learning that has rarely been surpassed in Polish history. Ossoliński was able to use his cleverness to great personal advantage, co-opting Austrian policies to expand his own personal library holdings. When Emperor Joseph II dissolved the monasteries, Ossoliński took the opportunity to expand his holdings through acquisition of many rare books and manuscripts. In his later years, he decided to transform his personal library into an institution to promote Polish literature, learning and history. 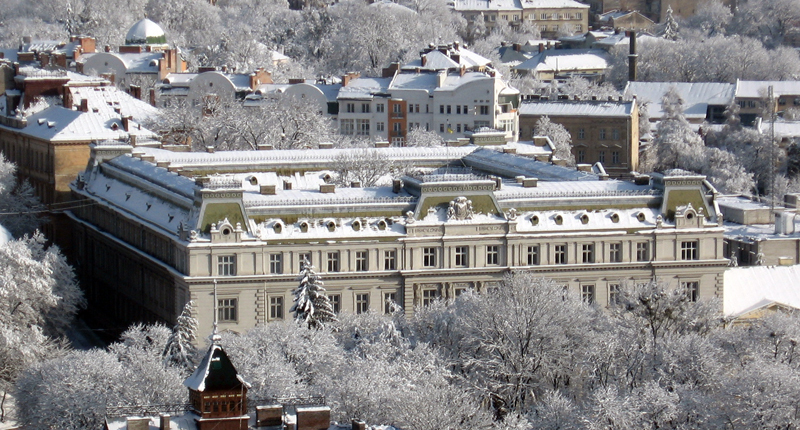 Ossoliński had earlier been involved in the reestablishment of the University of Lwów in Austrian ruled Galicia. This helped lead him to a decision years later that the city would become home to the Ossoliński National Institution (Ossolineum). To house the institution he acquired another asset from a shuttered monastery, an abandoned convent building. Within these walls, where spiritual enlightenment had once taken place, the enlightenment of intellect would now take precedence. Sadly Ossoliński did not live to see this happen. As a matter of fact, during the last years of his life he could not see at all. Ossoliński had lost his vision, but his love of learning was so great that he employed Polish students to read aloud to him. Ironically, this took place far from Lwów and Poland, Ossoliński lived out his finals days in Vienna where he died in 1826. The Ossolineum opened the next year. At the time of its founding, the Ossolineum was an island of Polish culture beset by sweeping tides of Germanism. The Austrian authorities had imposed the German language on Polish Lwów. The city’s was given a German name, Lemberg. The language on public signage was changed from Polish to German. The professional classes were completely dominated by Germans. The Poles were reduced to second class status in a city where they held a majority. The Ossolineum acted as a bulwark of Polish intellectual resistance. This alarmed Austrian authorities to the point that they took harsh measures against the Ossolineum during its early years. A director and his closest associates were imprisoned for treasonous activities. At times the entire facility was shut down and catalogs of its holdings taken away. During the Revolution of 1848, an Austrian general openly regretted that the building had not been subjected to artillery fire. It was only in the late 1860’s, following the Austrian loss in the Austro-Prussian War and the Habsburgs historic compromise with Hungary, that Polish culture was finally given room to blossom in Galicia. The Ossolineum was in the vanguard of this Polish intellectual renaissance. Illustrious Polish aristocratic families, such as the Lubomirski’s, bequeathed their entire personal museum collections to the institution. A famous publishing house developed, known as the Ossolineum Press. World War One delayed progress, but this turned out to be only a temporary setback. During the interwar period, the Ossolineum’s holdings expanded to over 220,000 works with everything from rare tapestries to coins to the largest newspaper collection in Poland. It was an incredible accomplishment of Polish intellectual achievement, but then the World War II began and everything changed. 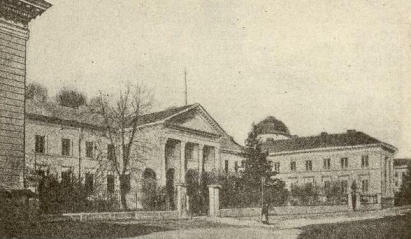 In 1928 an article entitled “The Centenary of a Great Home of Research in Poland, The Ossolineum, 1828 – 1928” in The Slavonic Review by Roman Dybosko stated, “the Ossolineum, now entering, in a free and reunited Poland, on the second century of its existence, we behold – and I think must admire – a house which has outlasted the earthquakes of a tragic national history, and proudly stands as a monument to the power of self-sacrifice and endurance, in the service of high ideals of culture and progress.” The author wrote this a little too soon because the worst earthquakes, from both east and west, were yet to come. Peasant agriculture meant dire poverty and even starvation. Between 1847 and 1889 no less than seven major famines occurred in Galicia, an average of one every six years. Following the abolition of serfdom in 1848 the condition of the peasantry hardly improved. Though the majority of peasants owned plots of land, their holdings were constantly diminishing. At the turn of the 20th century, the average peasant land holding was less than five acres. This would eventually be portioned out to their children. Thus if a peasant household had six children, that meant each would end up with less than an acre of land. To make matters much worse, peasant landholdings were largely non-contiguous. The average peasant owned twenty separate plots of land. One thing peasants did not have to worry about was taxes. That’s because over 99% of them were ineligible for taxation. This was due to the simple fact that they did not earn enough income. Even when something should have been good in Galicia for the peasants it was not. Millions were just trying to stay alive. As the modern age was dawning their situation was getting worse. Much of this had to do with population growth. Galicia had the highest density of rural population in all of Europe. This was despite the fact that emigration numbers were astronomical. In 1913, 400,000 Galicians left for other parts of the empire or abroad. Almost a million Galicians left for the United States from the late 1880’s through 1914. The question has to be asked, what was Galicia good for? To Austro-Hungarian administrators it was a source of raw materials. These materials took one of three forms, agricultural, mineral or human. It was a tragic irony that Galicia exported raw foodstuffs to the rest of the empire, while on average 50,000 Galicians died a year, either directly or indirectly due to hunger. The province was referred to darkly by the Poles as “Golicja i Glodomeria.” Goly and Glodny are the Polish words for naked and hungry. Yet it was the Ukrainians who suffered most from hunger. Agricultural techniques had changed little from medieval times. 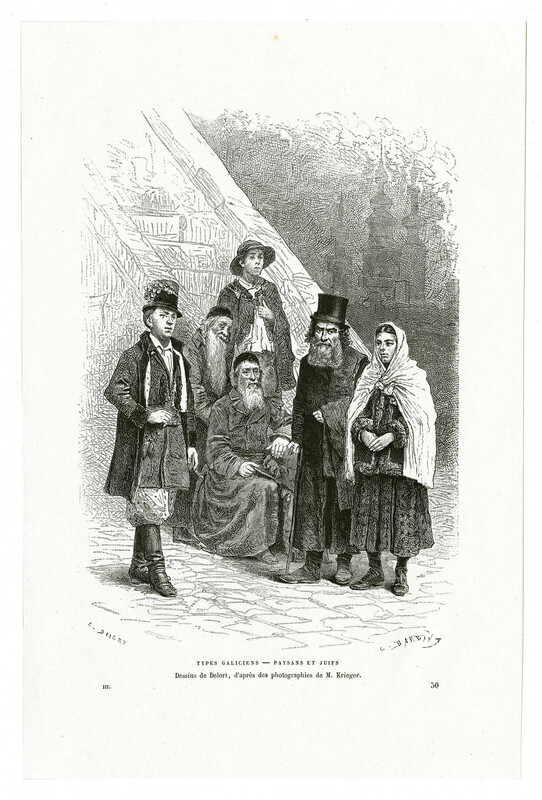 The Austrians first, then later the Polish bureaucratic ruling class took few measures to alleviate the suffering of the millions of unfortunates working the land. On the contrary, the powerful passed laws to benefit the interests of elites. Scientific and technological breakthroughs had the potential to transform the province, but Vienna was uninterested in sustained investment or industrial development for Galicia. Even when the Industrial Revolution began in earnest during the latter part of the 19th century throughout most of the Empire, Galicia was largely ignored. By the outbreak of World War I, only 9% of Austria-Hungary’s industry was to be found in Galicia. 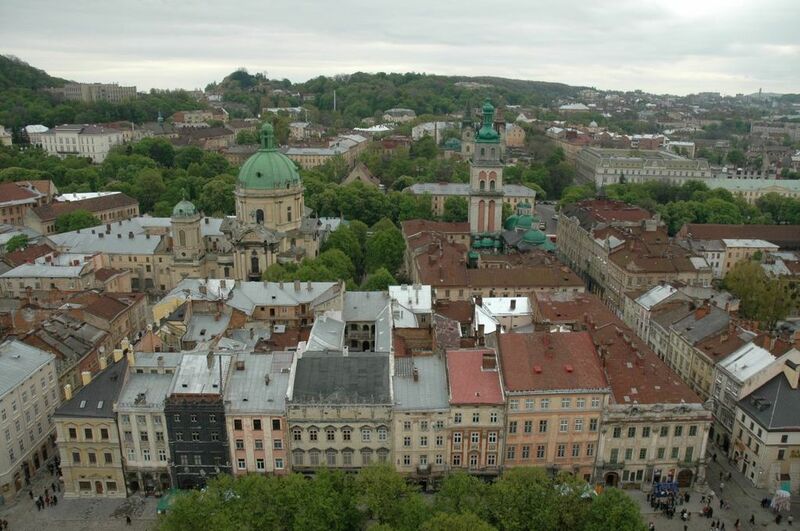 Workers in Lemberg (Lviv, Ukraine), the province’s largest city earned relatively meager wages, three-fifths those of a worker in Lower Austria. The one industrial bright spot was a burgeoning oil industry. By 1914, Galicia was producing five percent of the world’s oil. Of course, the profits generated from this boom were largely extracted from the province just like the black gold which spewed forth from the wells that had sprouted up and around the cities of Boryslav and Drohobych. Galicia was a province of paradox, rich in natural resources, totally lacking in social, economic and political means. The one thing Galicia produced throughout its existence was people. The Austrians were always interested in its vast reserves of manpower. This helped staff an army that was supposed to keep the Russian Empire at bay. Large military bases were built up at Lemberg, Przemysl and Cracow. Using Galicians for manpower did pose several problems. The Empire’s military and political leadership was suspicious of the Ukrainians in the army. They might well side with their brethren across the border in Russia. 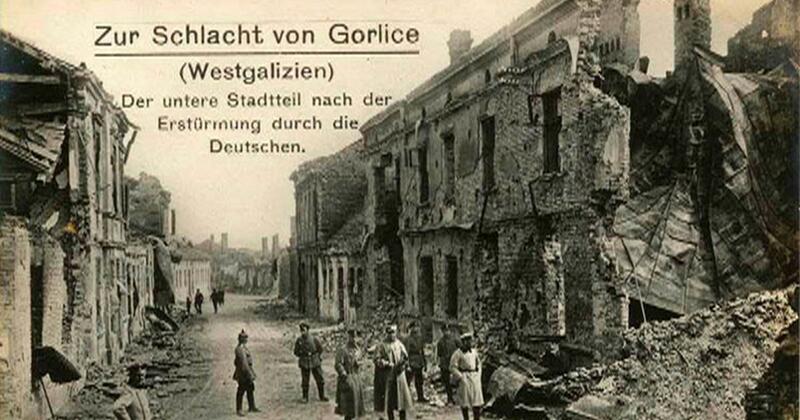 Fortunately, for the Austrians, Russia was hardly better than Galicia when it came to the treatment of the Ukrainians. In addition, potential manpower for the military was not as great as the population figures showed, since many males were not physically fit enough to serve. The province led the empire in the most men unfit for military service. 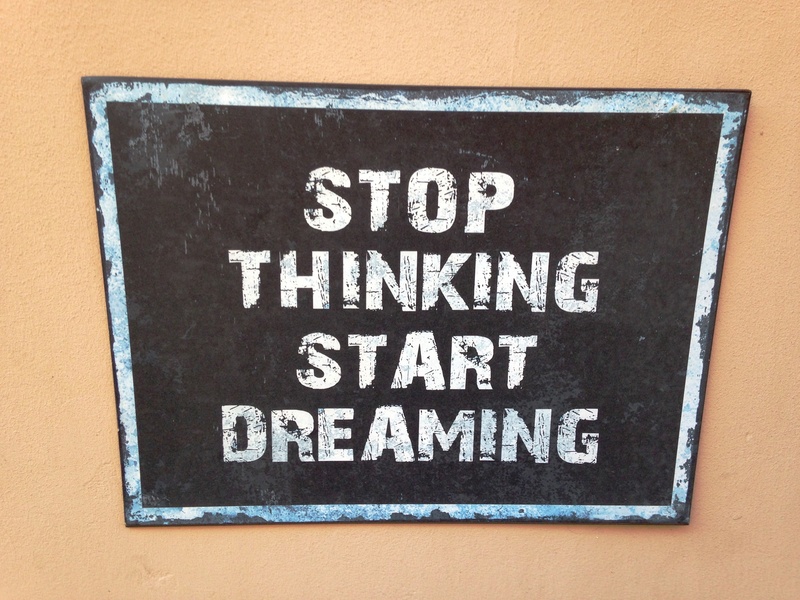 Bad diets and disease stunted growth. Everything Galicia produced seemed to have flaws. Such barriers to progress and development could have been rectified by the ruling class, but it was not in their narrow interests. The wars, military, ethnic and ideological that would consume Galicia between 1914 and 1945 ended up transforming everything through chaos and ultra-violence. It is hard to believe that Galicia could suffer more than it did under Austro-Hungarian rule, but it did. By the end of the Second World War, the Polish ruling class and the Jews had been destroyed. Ethnic Germans, who were largely guilty of these destructions, vanished either by violence or disappearance. The descendants of Polish and Ukrainian peasants inherited the kingdom’s land base, but they were still not free. Another empire, the Soviet Union, was now their overlord. This led many to look back at Austro-Hungarian rule as a halcyon period of progress and development. A rose tinted view of a Kingdom that was anything but. The Kingdom of Galicia and Lodomeria sounded wonderful then and still does today. The reality was totally different. The name was about the only thing that ever gleamed. The most instructive textbook covering the last two-hundred and twenty-five years of Eastern European history is not written on paper, but in stone. The western Ukrainian city of Lviv, home to some of the most atmospheric architecture in all of Europe, is also the location of one of its most fascinating necropolises, Lychakiv Cemetery. Cemeteries are built to memorialize the dead and Lychakiv is full of mournful statuary and sculptures, but it is also a place filled with the passions of life. These passions exhibited good and evil, idealism and radicalism in unwavering fervor to the most extreme ends. There are perpetrators buried here who were party to unspeakable crimes in the service of empire, royalism, nationalism, fascism and communism. There are victims buried here who suffered in the name of these same ideologies. Heroes and villains, the famous, infamous and anonymous all ended up together in Lychakiv. Their lives and deaths have become a lesson to the living of what human beings can become. 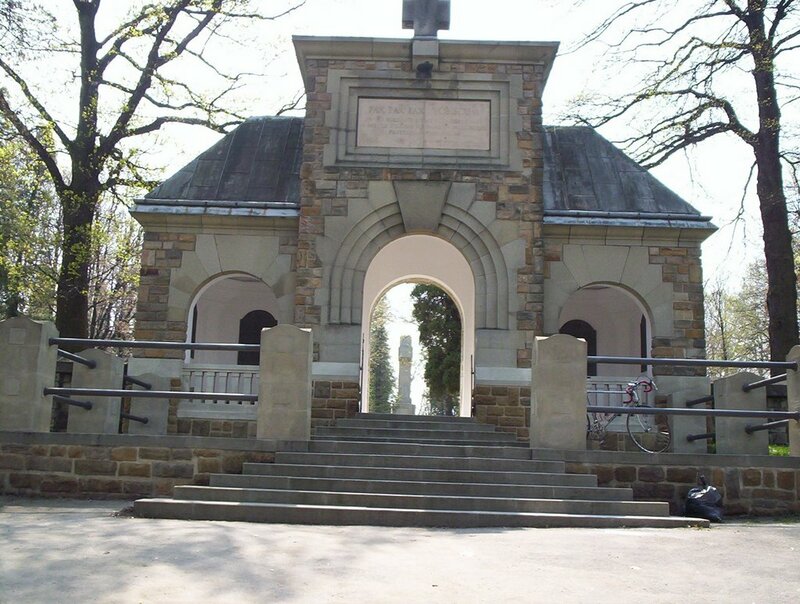 A walk through Lychakiv is not just a stroll through the past two centuries of this fated city’s history. It is also a window into the soul of humanity, for better and worse. The arched neo-Gothic entranceway to Lychakiv is a portal into a world of kaleidoscopic diversity. Plots and graves, tombs, chapels and mausoleums of every size, shape and configuration imaginable are packed together as thick as the foliage which consumes many of them. Many of these graves are architectural wonders in their own right. The juxtaposition of good and evil, vanished magnificence and depraved fanaticism can often be found interred and sometimes memorialized within a whisper’s distance of one another. Up and down uneven pathways, shaded by gigantic trees, illuminated by shafts of sunlight are the graves of Polish aristocrats and Soviet apparatchiks, Polish and Ukrainian nationalists, Ukrainian soldiers past and of the near present, soldiers of the SS Galician Division and the Red Army, all opposing each other in silence. 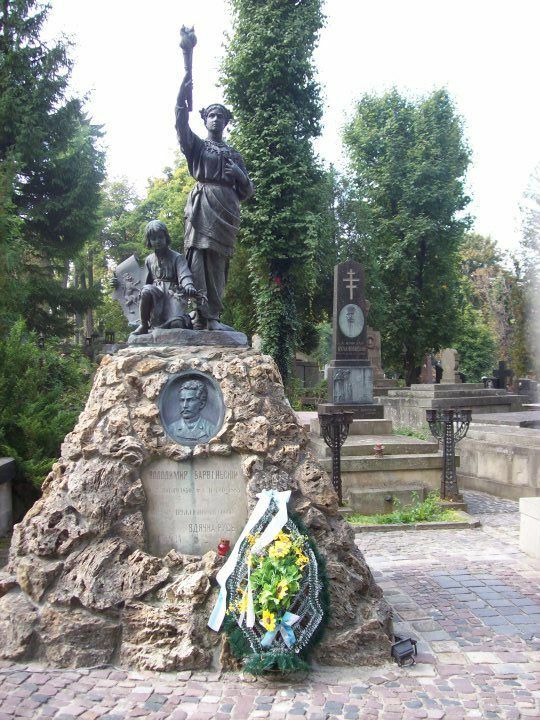 Ukrainian and Polish literary heroes, Armenians, Orthodox acolytes, Greek Catholics, Roman Catholics and the Lwow Eaglets, that flower of Polish youth who fought for Lwow in the hopes and dreams of the Second Polish Republic. 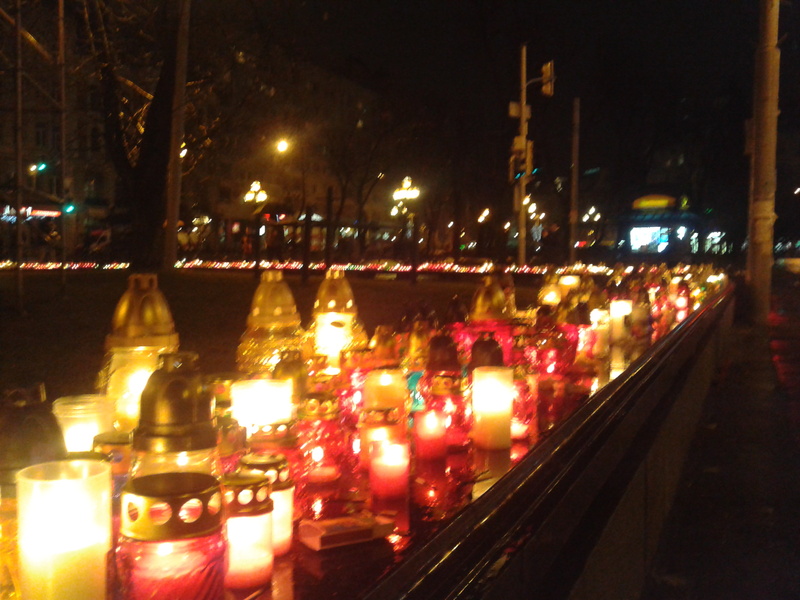 Victims of Fascism and Communism now rest side by side with little to distinguish them. For all of this haunting presence there is also the disturbing, ever present absence of Lviv’s once thriving Jewish community. And so it goes on and on. This is the way of Lychakiv, a way the world of Lemberg, Lwow, Lvov, Lviv once was and still is to a limited extent. The diversity of souls is much like itself, where patterns appear and disappear. A world where colleagues became enemies and cowards were turned into heroes, a space filled with dashed hopes and soaring dreams. Lychakiv is a place that is present inside all who live and breathe. This is where a whole world resides. 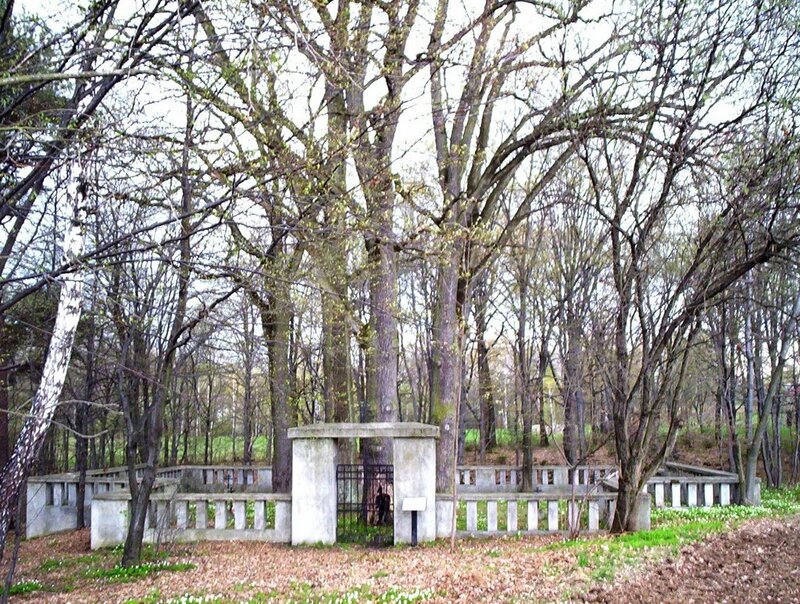 Lychakiv, like all cemeteries is supposed to be about ends, but what separates it, is that it can cause an examination of the means that were used to achieve those ends. Yet this cemetery also had to have a beginning. Despite its ancient and timeless feel its start occurred in neither medieval nor renaissance times. This seems a bit odd in a city that is known for its antiquated, rustic architectural aesthetics. Central cemeteries for the city’s dead were first conceived in the early modern age of the late 18th century. Up until its conception, the dead were buried adjacent to churches. The idea of large cemeteries away from the city’s urban areas was conceived to help protect the living from the dead. Bodies left in the open or given improper burials often lead to periodic epidemics which could demographically devastate the populace. At this time Lviv (then known by its German name Lemberg) was under the rule of the Austrian Habsburgs. They had taken control of Galicia in 1772. One usually does not relate cemeteries to modernity, but Lychakiv was a way to clean up and modernize Lviv. It would help bring the city up to standards of urban hygiene that were the rule in central and western Europe. In 1783 a decree was issued by Lviv’s authorities that banned burials within the city limits. Three years later, designated areas were set aside for burials, one of these was Lychakiv. 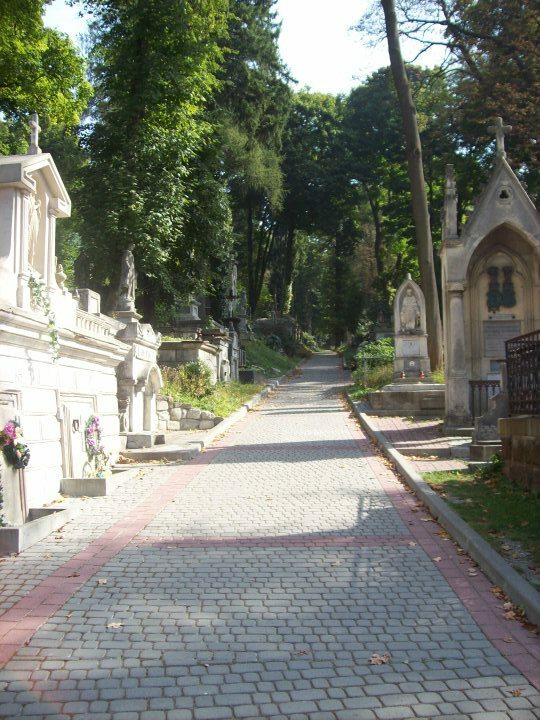 In 1787 the first burials took place at what was then known as Lyczakowski Cemetary. The name was Polish, as were most of the inhabitants of the city at that time. Poland was in the process of being partitioned and would no longer exist as a political entity by the end of the 18th century. 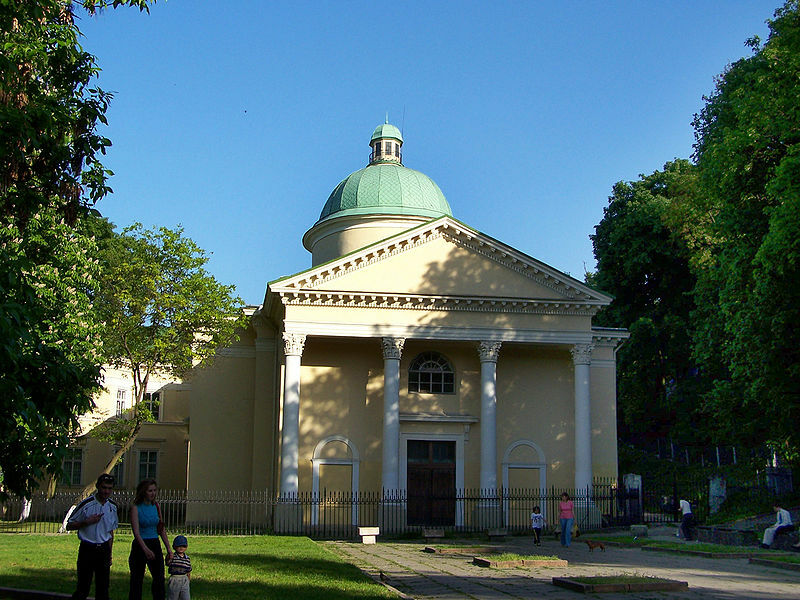 The city and cemetery were overseen by Lviv’s authorities. Many of these authorities would be Poles themselves, they continued to dominate the city even after Poland ceased to exist as a political entity. Death of empire, republic and ideology has been as much a part of life in Lviv, as the Lychakiv cemetery has been part of death in the city for over two centuries now. Poles may have been a majority in the city for much of this time, but they like so many others have now all but vanished from Lviv. This is nothing new or out of the ordinary for this place. No one ethnic group or nationality has been able to hold sway over Lviv in either living or dead form since Lychakiv came into existence. Just the same as no one group holds power over the past here. 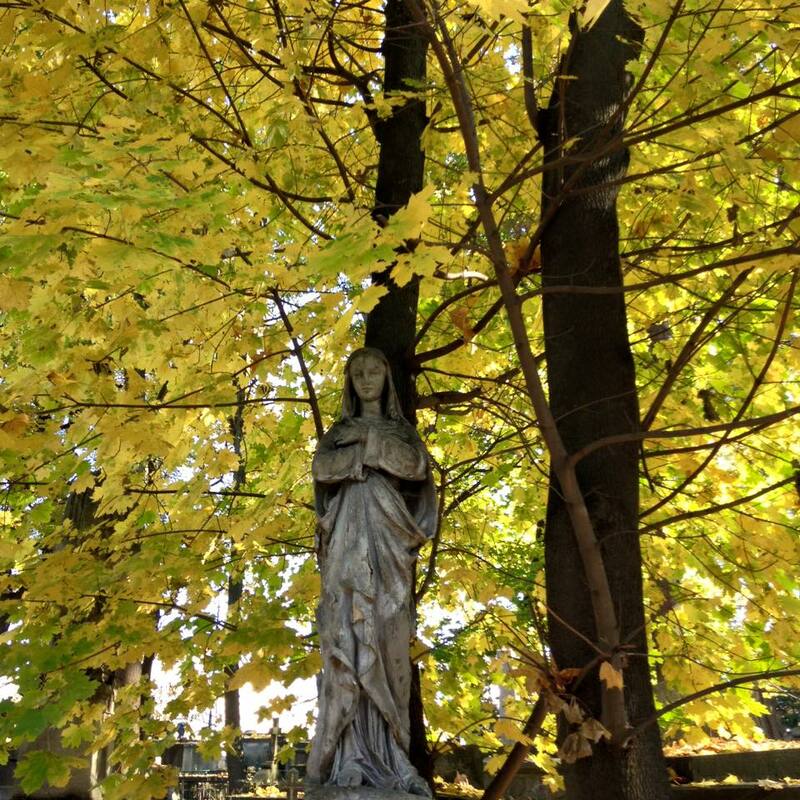 In this cemetery, permeated by so many silences, everyone seems to have a say. In Latin or Cyrillic, in German, Polish, Armenian, Ukrainian and Russian the names engraved in stone are what is left of the dreams, passions and folly from the vast waves of humanity who tried to control this astonishing city in an accursed region. Lychakiv today is a testament to the fleeting nature of power and passion. It exists, not so much to memorialize death, but to remember and contemplate life. Here in Lychakiv, is how a resurrection really feels. It is a truism in government that if you want to avoid getting something done than form a committee. And so it was regarding the state of Lviv’s Ratusha (Town Hall) in 1826. In that year, there was concern that the Ratusha – which stood in the middle of Ploscha Rynok (Market Square) – suffered from structural problems. A committee was formed to study the problem, which they did with chilling incompetence. Like so many committees, they came to the conclusion that doing next to nothing was the preferred option. They even went so far as to proclaim that the Ratusha was in good enough shape to last another hundred years. They were soon proved deadly wrong. The committee’s lone recommendation involved opting for minor, superficial upgrades to the exterior, a sort of architectural beautification project. Unfortunately, adding decoration to the facade turned out not to be the answer for more critical problems. Once that decision was made, the committee then started to haggle over the cost of the proposed cosmetic surgery. These proceedings were suddenly interrupted by a town official who rushed in to the meeting and informed the committee that the Ratusha had just collapsed. Several people had been killed, including the city’s beloved bugler. Lemberg (the official name of the city during that time as it was under Austrian rule) was in shock. The committee looked foolish and self-serving. It is both ironic and telling that the officials had chosen not to hold their meeting in the town hall, which subsequently collapsed. Perhaps they had their own doubts about the structure’s foundational weaknesses, if so, than they had been complicit in a crime of willful neglect. What had caused the collapse? The Ratusha was basically three different buildings of varying dimensions that had been fused together into one. This seemingly unwieldy, yet quite elegant design, included a tower that had been added in the previous century. At its tip was a crowned lion set atop a dome, the tower underneath had a gallery of eight pillars shaped like lions. It was this tower which collapsed sending nine stone lions, along with the rest of the tower crashing 58 meters (190 feet) on to the square. Following this cataclysm, the remaining part of the Ratusha was deemed beyond repair. The city officials in Lemberg were now tasked with the construction of a new Ratusha. Quite understandably public confidence in the city’s leadership was lacking at this point. It was here that another truism of government came into play, use a crisis as an opportunity. The city’s leadership took the opportunity to have the next Ratusha designed in a very different style than its predecessor. It took eight years to erect what was to be the new and supposedly improved town hall. Structurally the new building would turn out to be fine. After all it is still standing today, nearly two centuries later. Aesthetically though, the new Ratusha was lacking. Here was an opportunity to impose an Austrian influence upon the most celebrated public space in the city. The result was a huge structure of overbearing prominence at the center of the square, conspicuous by its girth rather than style. The new Ratusha was done in Viennesse Classicist style, reflecting Austrian ideals. 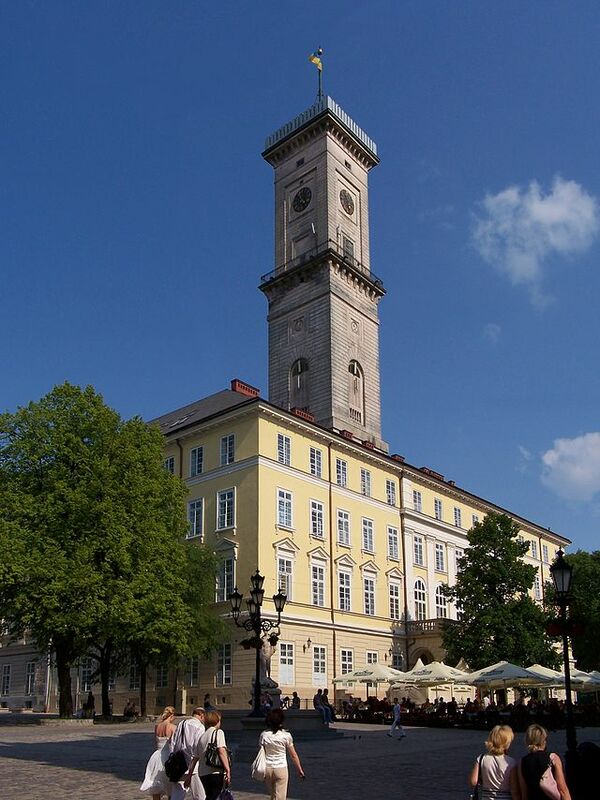 Soon citizens of Lemberg were heard to quip, that the new town hall was “a huge and hideous chimney.” Huge it was and still is today, with no less than nine floors and 146 rooms. The best that can still be said about its design is that it is really nothing special. Not good, not bad, just sort of there. Perhaps if the rest of Rynok Square and the historic center of Lemberg had not been so strikingly beautiful, no one would have much noticed. The best thing about the Ratusha as it stands today is the view from the top. After climbing an exhausting three hundred stairs, visitors get an incredible bird’s eye view of the city. It says something about the building’s aesthetics that it’s most memorable aspect comes from the top. There visitors are looking away from rather than at the building. From this vantage point, the Ratusha is hardly noticeable. Then again what would more could be expected from the same city leadership that had failed to anticipate the calamitous state of the previous Ratusha. They of course had been the main decision makers when it came to the new one. This version’s structural qualities have been problematic as well. 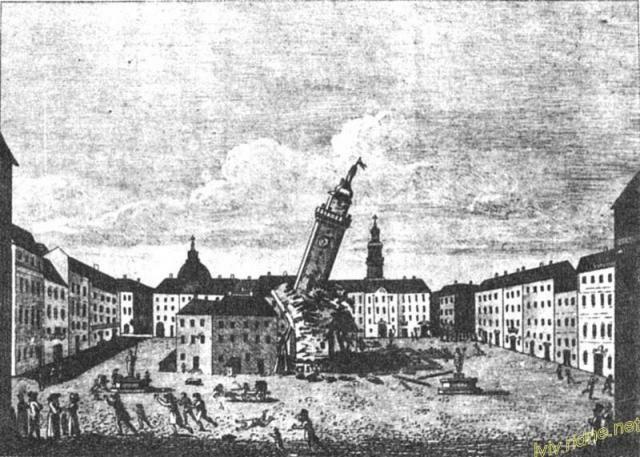 In 1851, less than two decades after it had been erected, the new Ratusha’s clock tower collapsed. Fortunately, this did not mean the wholesale replacement of the entire structure. The clock tower was soon replaced. The newest version of the Ratusha has stood the test of time, as two World Wars, communism and fascism have failed to make much of a dent in the building. One of the nicer more noble adornments on the present Ratusha, are two lions holding shields set on each side of the entrance to the building. Having the lions only a few steps from the square ensures that there will be no repeat of lions crashing to their ruin, as happened one hundred eighty-eight years before. 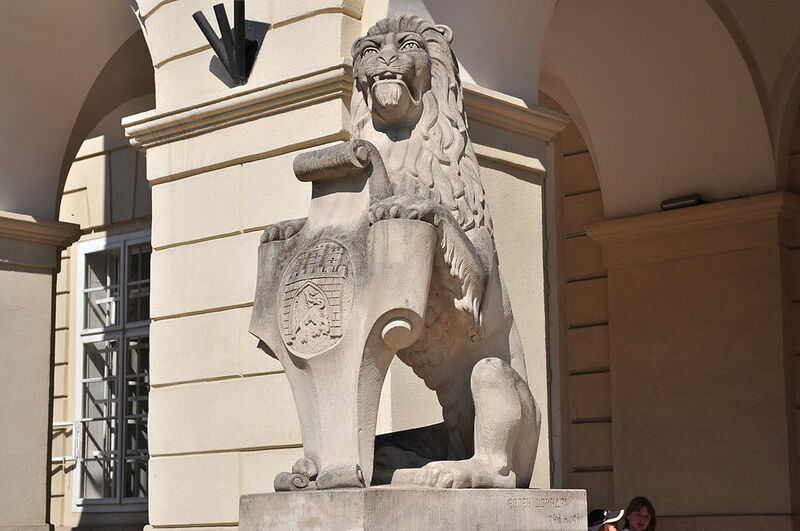 The lion is the symbol of Lviv and something of a legendary guardian of the city, but in this case the city has safeguarded its lions, at least those ones made of stone. The lions could be replicated in stone, but the flesh and blood bugler never returned to the Ratusha after the last one’s fatal fall in 1826. Historically the bugler’s role included watching the horizon from on high, in order to warn the city of any would be invaders. The bugler also kept watch for fires, sounding the alarm if one was spied. The bugler’s call had been part of the daily ritual of life, providing the sound of security each hour for decades on end. When the new Ratusha was completed, the bugler position was left vacant. As the years, turned into decades, the bugler was all but forgotten. Modernity made the bugler’s traditional role obsolete. In a sense the bugler was the last casualty of the fall of the old Ratusha. The bugler’s role was individual and superseded officialdom. The bugler never needed to form a committee while making split second decisions that might decide the life and death of the city. Instead a bugler relied on instinct to discern signs of danger. It is a pity that the city committee did not ask the bugler’s advice when they decided that the old Ratusha was in good repair. The bugler might have informed them otherwise, but then again, the committee might have to take action and be decisive, the very opposite of why committees are formed. In this case, as in so many others inaction and indecisiveness had fatal consequences. Goodbye to All That, that famous post World War I book, is the autobiography of Robert Graves, the English poet, writer and scholar. Much of the book deals with Graves traumatic experiences during the war. The title ironically refers to the passing of the old order that existed prior to the war. Such ideas as duty, honor, patriotism and by extension empire all were sacrificed at the front. For Britain the old order died on the battlefield and so too for many other empires and nations. But for Britain, though it would suffer again in another worldwide conflagration just a couple of decades later, its most traumatic experience ended with the First World War. A way of life, a way of belief, died once and for all time. Sure there was much horror and loss, triumph and decline to come, but the worst for Great Britain was over with by the Great War’s. On the other hand, for Eastern Europe the horrors of the First World War were only the beginning. The region has spent the past one hundred years saying goodbye to all that, again and again and again. The war was just the start, both a beginning of the end and the start of a series of new beginnings that keep coming to an end. 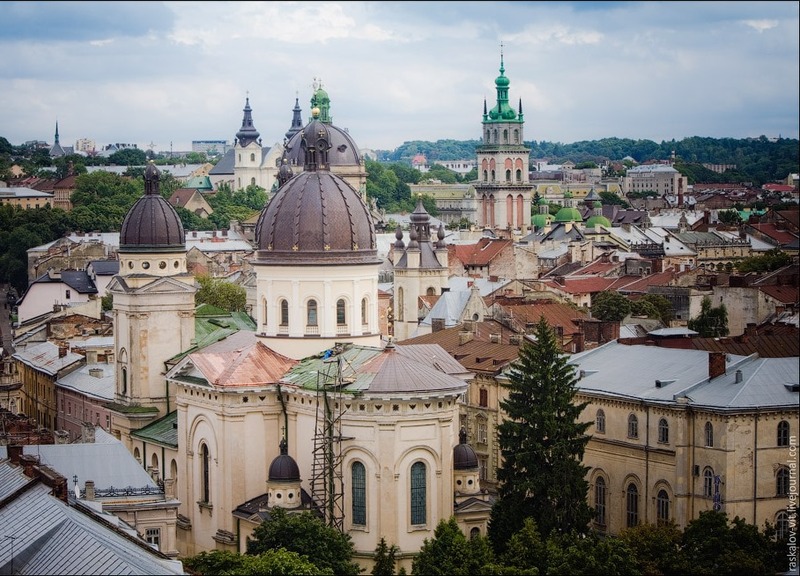 There is no place which better reflects this continuing series of historical upheavels than Lviv in the western Ukraine. It sits astride the geopolitical fault lines of east and west. 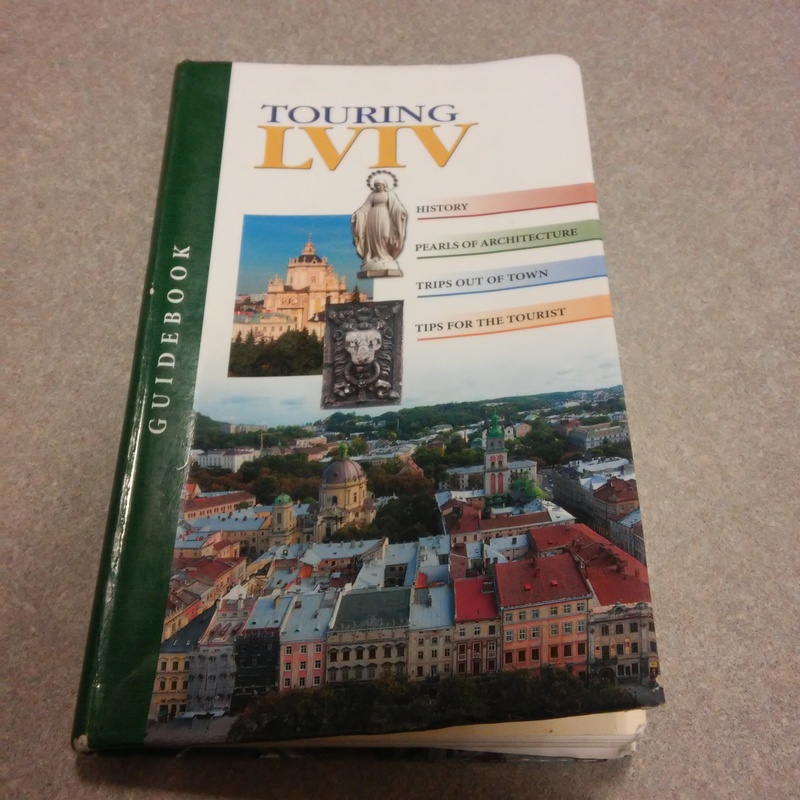 The city began the 20th century as Lemberg, morphed into Lwow and finally transformed into Lviv. It has spent the past one hundred years saying goodbye to one war, one revolution, one ideology at a time. 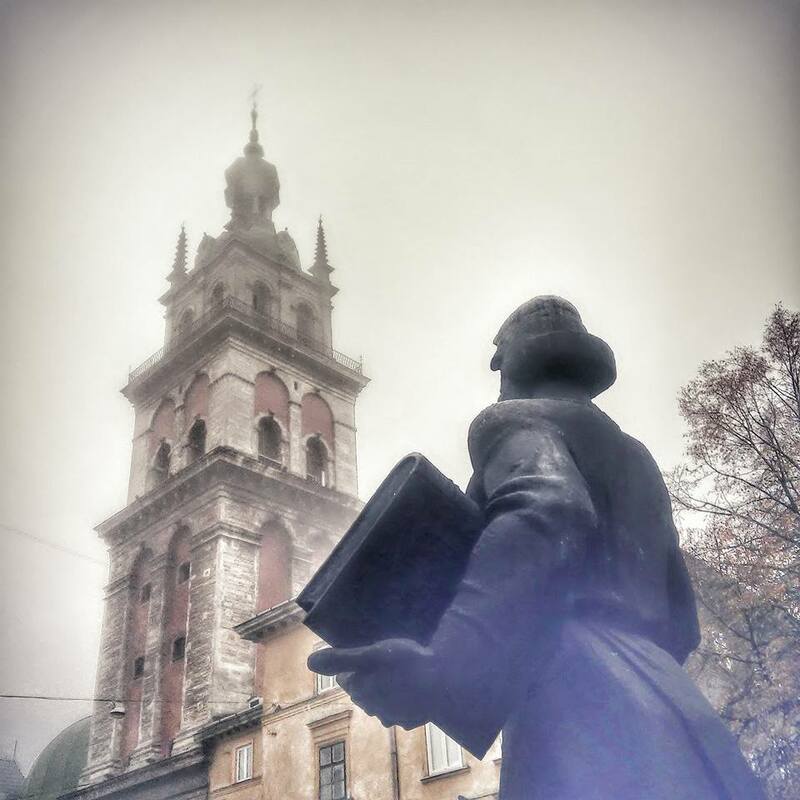 What is it that Lviv keeps saying goodbye to? The old order, but which one. Consider that if there is someone in Lviv today who is one hundred years old (and in a city of 725,000 citizens there must surely be at least one), then they have lived under at least eight different political regimes, two of which were among the most lethal in human history and all of which repressed the population to a greater or lesser extent. Lvivites have suffered, survived and amazingly even thrived under a withering array of empires, nations and political entities. Life has never been boring for them, even if history has been unkind and often cruel. Imperial, ideological and idiosyncratic usurpers have come and gone, with baffling swiftness and terrifying brutality. There was the Austro-Hungarian Empire which vanished, but left a lasting architectural and cultural imprint. It lost Lviv to the Russian Empire for nine months during the war, an interlude of occupation that saw the last Tsar, Nicholas II visit the city, but his empire was pushed back and then swept away, as were the Austrians by the end of the war. The first successor state, the West Ukrainian People’s Republic, lasted all of three weeks. A sneeze mistaken for a hurricane at the time. Despite its brief tenure, it would have an afterlife of influence that would eventually be resurrected. This still born republic was followed by two decades of another one, specifically the second Polish Republic. A golden age for the Poles, but like all golden ages, it is called such because worse, much worse followed. And that was the rule of the Soviet Union, two horrific years of purges and purgatories followed their occupation and incorporation of the city. Then the Germans arrived, an ill wind from the west and scattered the Soviets. 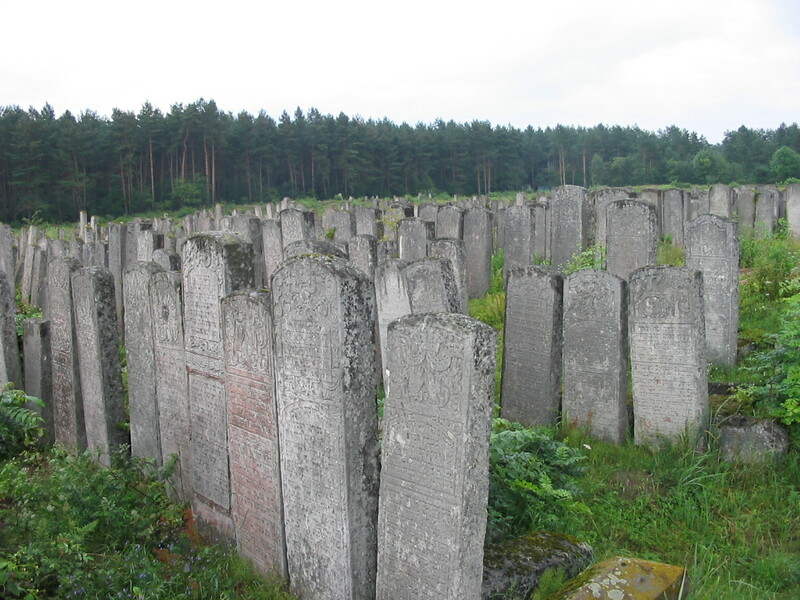 They proceeded to blood spatter and scatter Lviv’s vibrant Jewish community with a whirlwind of holocaust. The Germans came and went, their blitzkrieg moving as fast in reverse as it had moved forward during invasion. In their wake, the Soviets came once again to purge and repurge in the name of Stalin. The Poles were moved out, more Ukrainians moved in. In barely the space of five years, Lviv had suffered four rulers, one ethnic group eradicated, another one expunged and a greatly oppressed one suddenly favored. This was history as whim, as caprice, with neither logic nor empathy. The Soviets stayed for the next four and a half decades, a miracle of mediocrity, corruption and stasis. That must have seemed like a lifetime, but the clock was ticking away their time in power. The only difference is that in this case the clock moved much slower. Perhaps the clock had no hands, stolen like so much else from this charming city. Ukrainians finally put the hands back on the clock and reset the time in 1991. As it began to tick forward, the nation of Ukraine was finally born once, but not for all time. It was a false dawn. Progress slowed to a crawl, bogged down in a quagmire of corruption. The bog of corruption seemed to thicken as the years went by, but then it froze this past winter and the people found their footing. It started at Independence Square and the Maidan in far away Kiev, but the truth is that resistance never really ended in Lviv. It is in this border lands DNA. The most Ukrainian city in the Ukraine is just that, always and forever. It has said farewell to so many and so much. It has become a habitual heart breaker of political entities. It confidently declares independence and the rest of the world reacts with shock. Was a new nation being born? Was an old one being given new life? Lviv and the greater region just passed into its eighth political iteration in just a century’s time. At this point the wheel of history here is not so much turning, as it is spinning. Propelled forward by an unseen force, the will of a people who have decided to take hold of their future. Fate has had its way with Lviv over the last hundred years, well goodbye to all that. It is finally a city’s, a region’s, a people’s turn to have their way with fate.